Henry Newman Barwell, lawyer and premier, was born in Adelaide on 26 February 1877, the son of an Adelaide merchant, Henry Charles Barwell, and his wife Clara, née Brooke. The young Henry was educated at Whinham College and St Peter’s College, going on to Adelaide University, where he graduated in law. Barwell was articled to the firm of Wilson and Toler-Rowley and called to the South Australian Bar in 1899. After practising briefly at Clare, he moved in January 1900 to Port Pirie, where he established a firm of solicitors, Barwell and Hague. On 19 August 1902, at St Barnabas’ Church of England, Clare, Barwell married Anne, daughter of the rector of Clare, Canon Webb. There were to be three daughters and a son of the marriage. Barwell’s practice prospered, and the Barwell family lived in a fine house near Port Pirie. 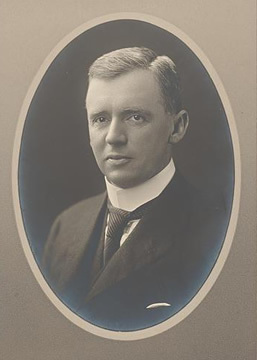 As one interested in ‘local affairs of public moment’, Barwell was to serve as president of the Port Pirie School of Mines, president and committee member of the local Mechanics’ Institute, and, from 1908, as Sweden’s vice-consul in Port Pirie. In February 1912, Barwell unsuccessfully contested the seat of Stanley for the House of Assembly as a Liberal Union candidate; he tried again in March 1915, was elected, and held the seat for a decade. From the outset, his parliamentary stance was forthright. In his first speech, he declared: ‘I am not going to be . . . an idle or a silent member’. He championed ‘the Empire and the Empire’s cause’, argued for retirement allowances for police officers and advocated improvements in technical education. He held the portfolios of Attorney-General and Minister of Industry in July and August 1917, and from April 1918 to April 1920. During his second term as industry minister, he was responsible for the establishment of a department of town planning and was behind the creation of a garden suburb at Mitcham in Adelaide. In April 1920, Barwell became Premier and Attorney-General. He believed that sound government was best achieved through a minimum of legislation, an efficient public service, and well-run government instrumentalities. Barwell appointed a royal commission to inquire into South Australia’s public service in 1921, and, with the state’s first chief commissioner of railways, W. A. Webb, reorganised the South Australian railways. The bellowing sound made by the new diesel locomotives at crossings earned them the name, ‘Barwell Bulls’. In 1922, Barwell attempted to replace existing compulsory arbitration provisions with a system of conciliation boards and industrial agreements. His legislation came to grief when three members of the Liberal Party crossed the floor to vote against his proposals. However, the ‘Barwell Boys’ Scheme’ (a child migration program) achieved some success. Barwell’s Government was defeated at the April 1924 election, and Barwell, who had been appointed KCMG in June 1922, became Leader of the Opposition. On 18 December 1925, he waschosen at a joint sitting of the South Australian Parliament to fill the casual vacancy arising from the death of Labor’s J. V. O’Loghlin. His selection was unusual in that it ignored the precedent that Senate casual vacancies should be filled by someone from the same party as the senator who had previously held the seat. However, at the time, the matter did not seem to concern South Australia’s Parliament or press. In his first Senate speech, on 15 January 1926, Barwell, signalling his intention to concentrate on matters vital to the states, declared himself a supporter of constitutional change through referendums. Barwell was convinced that the Senate, as ‘a States House, with a special mandate to conserve the interests of the States’, had a crucial role in the financial arrangements between the Commonwealth and the states. He called for a review of Commonwealth–state financial relations, which he considered could be performed more effectively by Parliament than through a constitutional convention. Barwell believed that the Commonwealth could effect greater economies, particularly through cutbacks to its public service. He proposed amendments to the Commonwealth Conciliation and Arbitration Act, aimed at giving the Conciliation and Arbitration Court power to enforce its own decisions. In January 1926, Barwell clarified his views on White Australia, claiming that he had been misrepresented in his home state. While stating that the policy was ‘a great ideal’, and that he supported ‘whole-heartedly’ his Government’s position on it, he queried whether it would be ‘practicable’ to overcome the ‘stagnation’ of the Northern Territory without the assistance of coloured labour. He added that, since the Territory had been taken over in 1910 by the Commonwealth, its administration had been ‘a tragedy’. Living up to his reputation as a man of strong independent opinion, Barwell opposed the Bruce–Page Government’s Constitution Alteration (Industry and Commerce) Bill on the grounds that it was ill-conceived and that the provision made for parliamentary debate and public discussion of the measure was inadequate. Barwell recommended that ‘a special constitutional session’ be convened to examine such major reform proposals: ‘I am anxious to be in line with the Government [and] to keep in step with Ministers’, he stated, ‘but I refuse to do that at the sacrifice of conscience’. At the Bill’s third reading Barwell’s vote was the only one in dissent. In 1927, Barwell again opposed the Bruce–Page Government—this time over its States Grants Bill, which he regarded as a serious attempt to upset the ‘financial partnership’ between the Commonwealth and the states. ‘There is no doubt’, he said, ‘that the people of Australia are looking to the Senate—the chamber specially constituted to safeguard the interests of the States—to see that their rights are not in any way infringed’. Such sentiments did not endear Barwell to the executive, particularly Prime Minister Bruce. In January 1928, Barwell was asked by the South Australian Government to advise a committee which had been appointed to present the South Australian case to the royal commission on the Commonwealth Constitution. On 25 and 26 January 1928, Barwell himself gave lengthy evidence to the commission. He stated that while he spoke as an individual, he had been requested by the South Australian Government to address the disabilities suffered by South Australia as a result of Federation.Barwell reaffirmed his view that compulsory arbitration had failed. He saw wages, prices and customs duties as a ‘vicious circle’. To break this circle, he said, ‘it is necessary . . . to put an end to the system of compulsory arbitration as it is applied at the present time by the Arbitration Courts of Australia’. Referring to his two years in the Senate, he asserted that as a States House, the Senate had failed, but that he supported its role as a house of review. Speaking on Senate reform, he supported electoral change through the introduction of proportional representation. However, he did not consider that this would in itself enable the Senate to function as a States House, and favoured the constitution of the German Reichsrat, which included a ‘council consisting of representatives of the governments of the States’ with ‘suspensory veto’ rights. He declared that he was so opposed to the party system dominating the Senate that he had not attended his federal party meetings for the past eighteen months. On 22 March 1928, Barwell resigned from the Senate. In his evidence to the royal commission, in which he strongly supported the need for the continuance of agents-general in London, it was apparent that he had accepted the position of Agent-General for South Australia. This decision may have been due, not only to the obvious attractions of the post and release from the rigours of the two-day train journey from Adelaide to the new bush capital of Canberra, but also to his realisation of the decreasing power of the Senate to fulfil its constitutional role as a States House. Barwell remained Agent-General in London until 1933, promoting South Australian land settlement, and Empire trade and Imperial preference. In 1940, Barwell attempted to re-enter Parliament, but failed to gain pre-selection for his former seat of Stanley. Increasing deafness prevented his return to the Bar, but he pursued an active ‘retirement’ through charitable work for institutions such as the Royal Adelaide Hospital. Barwell died at his home in the Adelaide suburb of Unley Park on 30 September 1959, and, after a service at St Columba’s Church of England, Hawthorn, was cremated at the Centennial Park Crematorium. Lady Barwell and their four children survived him. The Times obituarist wrote that Barwell’s ‘strong political individuality’ had not suited the federal sphere. It may have been closer to the truth to say that Barwell, who had remained committed to the Senate’s constitutional role, was not suited to Australia’s increasingly rigid party system. H. T. Burgess (ed. ), The Cyclopedia of South Australia, vol. 2, 1909, Cyclopedia Company, Adelaide, p. 526; Barwell file, ADB, ANU; Maryanne McGill, ‘Barwell, Sir Henry Newman’, ADB, vol. 7. SAPD, 22 July 1915, pp. 206–208, 30 September 1919, p. 970, 24 September 1919, p. 876, 18 November 1919, pp. 1874–1876, 22 August 1922, p. 350, 9 August 1921, pp. 177–178, 191–193, 25 August 1920, p. 410, 26 September 1922, pp. 660–683, 31 October 1922, pp. 1278–1280, 28 November 1922, pp. 1841–1850, 30 November 1922, p. 1909; J. Holland Rose, A. P. Newton, E. A Benians and Ernest Scott (eds), The Cambridge History of the British Empire, Cambridge at the University Press, 1933, p. 620; Senate, Journals, 13 January 1926. CPD, 15 January 1926, pp. 97–106. CPD, 20 January 1926, pp. 138–139, 27 January 1926, p. 363. CPD, 17 June 1926, pp. 3188–3200; Geoffrey Sawer, Australian Federal Politics and Law 1901–1929, MUP, Carlton, Vic., 1956, pp. 280–281; Senate,Journals, 25 June 1926. Senate,Journals, 27 March 1926; Gavin Souter, Acts of Parliament, MUP, Carlton, Vic., 1988, p. 207; CPD, 16 March 1927, pp. 480–492; Letter, Barwell to Sir Josiah Symon, 18 January 1928, Symon Papers, MS 1736/15/16, NLA; CPP, Report of the royal commission on the Constitution 1929, minutes of evidence, part 4, pp. 963–975, report of proceedings, 19 September 1927, p. 7. Advertiser (Adelaide), 19 September 1933, p. 9, 24 November 1933, p. 25, 1 October 1959, p. 3; The Times, 1 October 1959, p. 16. This biography was first published in The Biographical Dictionary of the Australian Senate, vol. 1, 1901-1929, Melbourne University Press, Carlton South, Vic., 2000, pp. 208-211.